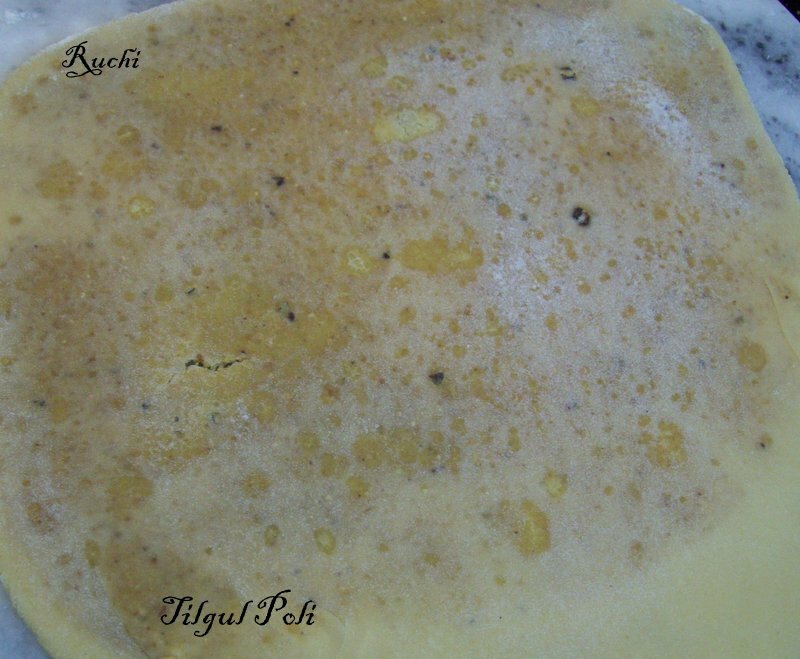 This is my very first experience of making Gul Poli (Maharashtian cusine)Jaggery flatbread.I learn this recipe from my Maharashtrian friend. A version stuffed with jaggery and ground sesame seeds (til) is especially made at one of the which is celebrated either on the 14th or 15th of January. Traditionally, Maharashtrian people wish each other Tilgul ghya goad bola ("Enjoy gulachi poli and speak sweetly") to encourage good relationships. The actual process of stuffing, rolling and cooking did not take very long, but the preparations took quite some time. The poli was pretty good and not too sweet. My Family absolutely love this dish. 1.Mix all the flours. Make a well in the middle, heat oil and add it to the flour.The oil should be sizzling hot .Then mix it nicely and remove all lumps. 2.Now start kneading the soft dough by adding little milk at a time. 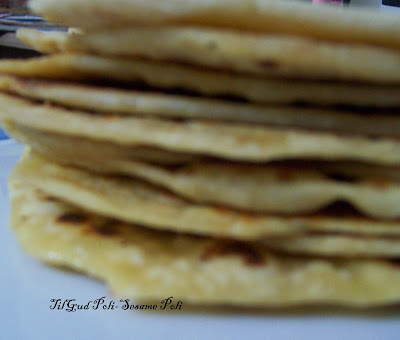 Consistency of dough should be soft like a regular chapati dough. Apply few drops of oil on dough and cover it. Let it rest for 30-40 minutes. 3.Now for filing, grate the jaggery.Heat Ghee in a pan add chickpea flour and roast it. Add Ghee as required little at a time. Keep stirring continuously. 5.Roast sesame seeds, poppy seeds and coconut one by one. Grind it powder one by one and mix. 6.Add ground sesame seeds and coconut, cardamom powder, nutmeg powder along with roasted besan and jaggery grind this mixture in a mixie till they are well combined. 7.Mix all ingredients well and make equal sized balls. 8..Make equal portions of dough. Sprinkle some all purpose flour on rolling board. 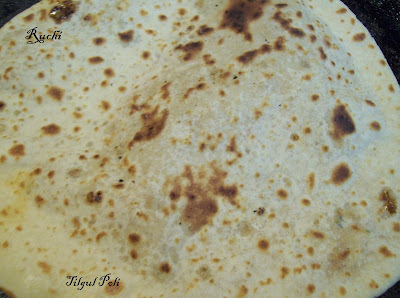 9.Roll the dough to the size of puri.Place a ball of tilgul filling in the center close it by covering the edges at top so that the fiiling will not come out. 10Use more flour and roll it till it become normal roti size or 7-8 inches in diameter. 11.Heat the griddle (tawa) put some ghee roast it from both the side using ghee on medium flame till it turns golden brown. Serve crispy Gulpoli with ghee .